On November 2, 1512, the Renaissance master, Michelangelo, finished what would become his most famous painting. He painted the entire ceiling of the Sistine Chapel in Rome. The giant fresco painting took four years to painstakingly complete. The ceiling is divided between different episodes in biblical history. The most famous is the Creation. 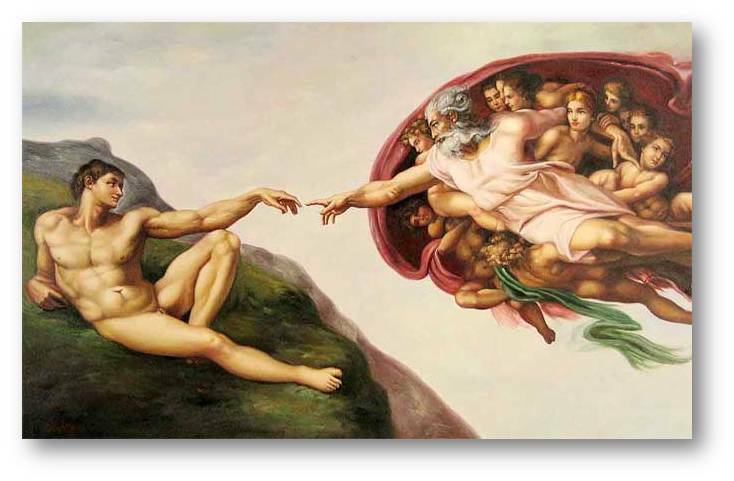 In the painting, God reaches down his finger and touches Adam’s outstretched hand. At the point of two fingers, God and man meet. Where can you meet God? You don’t have to travel the world to find him. You don’t have to leave your home. God is everywhere. Yet our God is a hidden God. You can’t see him. You can’t find him in a tree or watch him on TV. You can’t know God unless he reveals himself to you. Our God has chosen to reveal himself to us in his Word – the Bible. Through his Word, we see God. Through his Word, we know God. Through his Word, we come to trust God. In his Word we meet Jesus, God made man. In Jesus, we meet God face to face. In Jesus, we see how much God loved us. In Jesus, we see how God saved us from an eternity of loneliness in the heartbreak of hell. On the cross, God’s fist came down and punished Jesus for all the dumb and hurtful things we do. Because of Jesus, God forgives us. Because of Jesus, all those who believe in him will one day see God face to face in the happiness of heaven. Jesus is the point where God and man meet. Do you want to meet God here on earth? Do you want to touch his finger and see his face? Every Sunday at church, as we hear his Word proclaimed, God comes to meet us. Though we can’t see him with our physical eyes, he reaches out to us through his Word and touches our hearts. And there in his house, God comes to meet his people in a very real and visible way. Holy Communion is one of those points where God and men meet. When you receive the bread and wine in the Lord’s Supper, God is there. His body and blood are there. As you taste the bread and drink the wine, God’s finger comes down and graciously touches you, assuring you that you are his and that heaven is yours. At the Sistine Chapel, you can see God and man meet at the point of two fingers. You can experience that personally through God’s Word and Sacraments. That is where God and man meet.